Since the Company was established in 1977 we have built up a vast knowledge of Service, Repair & Breakdown Procedures. We currently have 8 Service Technicians delivering this high quality of work, each with their own specialist area. They regularly attend manufacturer training courses to bring out the best in your machine. 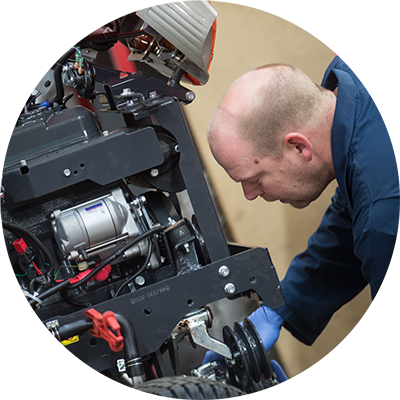 We offer Servicing, Repairs and Breakdown services for most makes and models of Tractors, Plant, Utility Vehicles, Quad Bikes, Ride-on and Walk-behind Mowers, Chainsaws, Hedgecutters, Brushcutters, Leafblowers/vacs, Pressure Washers & Generators etc. General Engineering Services are also available include Welding, Lathework, Sandblasting, Sharpening, Grinding, Pressure and Flow Testing. We strongly recommend your machines are serviced annually or in accordance with the Manufacturers Service Schedule to maintain Warranty cover, ensure reliability/longevity and protect the operator from personal injury. We charge an inspection fee of £20.00 + VAT to carry out a diagnostic check on any broken down or faulty machinery. This is paid in full when the machine is booked in with us. This is a non-refundable charge. In most situations this charge is sufficient to cover the labour charge incurred to diagnose the fault. This is not the total cost of the repair. Extra charges may be added for parts and labour as and when required to complete the repair with your permission. If our technician deems the machine to be beyond economical repair, a 50% refund of the inspection fee will be made and deducted from the price of a new machine if you decide to purchase one from Major Owen Ltd. A scrappage fee of £10.00 + VAT will be charged if you would like Major Owen Ltd to dispose of the faulty machine. This will be refunded in full if you decided to purchase a new machine from Major Owen Ltd.
Collection/Delivery Service available (subject to a charge to cover transport costs). contact the Service Department on 01766 770261 or email us on service@majorowen.co.uk.